Submitted by Taps Coogan on the 18th of September 2018 to The Sounding Line. This being the ten year anniversary of the 2008 Financial Crisis, financial writers are waxing poetic about how much (or little) has changed in the past decade. Most analyses point to the actions of the Federal Reserve and other central banks as having ‘saved’ the global economy from certain doom. Underlying the Federal Reserve’s unprecedented response to the 2008 Financial Crisis, is the idea of the ‘wealth effect.’ The wealth effect is the theory that rising financial asset prices creates wealth that encourages consumer spending and that increased consumer spending stimulates the economy, creating self sustaining broad-based economic growth. It is a fallacy. It is a fallacy not because rising financial assets don’t create wealth, but because the way the Fed induces rising asset prices causes other countervailing effects. The Fed induced rising asset prices by keeping short and long term interest rates artificially low for nearly a decade after the US economy had emerged from the 2008 recession. The result was a migration of capital into higher risk assets, creating a strong bull market in stocks and lower quality bonds. Investors with a significant allocation to risk assets have made tremendous gains since 2009. 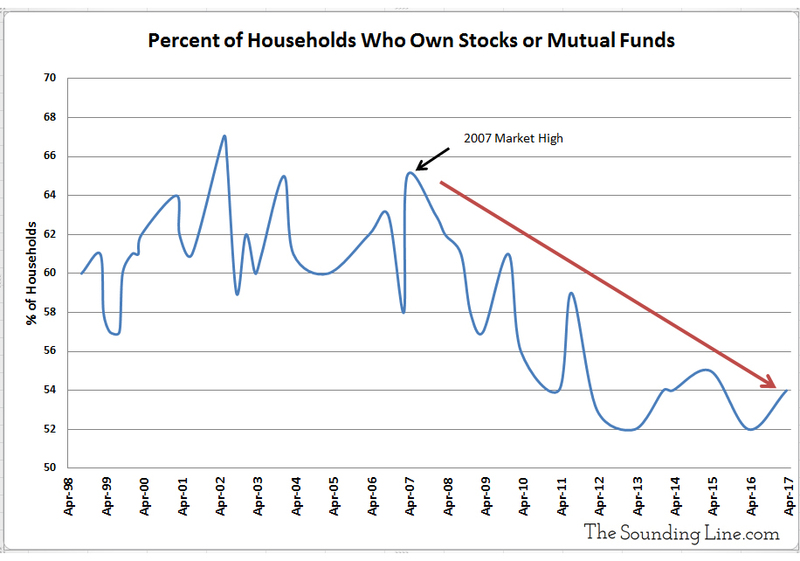 Unfortunately, a declining percentage of Americans actually own significant quantities of risk assets. Middle and lower income Americans spend virtually all of their income. Nearly every extra dollar of income in the hands of an average American gets spent in its entirety. Wealthy Americans spend less of their income. They have larger savings. A smaller portion of every dollar of extra income in the hands of a wealthy American gets spent. Trying to stimulate the economy by depriving the majority of Americans of interest income on their modest savings in the bank in order to provide extra income for wealthy Americans who will save a large portion of that extra income doesn’t work, and it didn’t. It led to the largest division of wealth since the Great Depression and a decade of below average economic growth. American households (and non-profits) had roughly $8.2 trillion in bank deposits, savings, and money market funds at the start of 2009, more than they held in stocks and mutual funds combined ($7.4 trillion). Between 1971 and 2009, Americans earned an average of about 6.6% interest on 3-month CDs at the bank. During the period of the Fed’s ‘Zero interest Rate Policy’ (ZIRP), these very same people earned less than 0.35% on the same instrument. That means that the 92% of Americans with bank accounts lost roughly 6% interest a year on their savings because the Fed held interest rates artificially lower. Average yearly returns on the S&P 500 rose roughly 4.6% from 10.5% before the crisis to 15.11% during the period of the Fed’s zero interest rate policy. In other words, the Fed reduced interest income on savings accounts by 6% in order to boost stock gains by roughly 5% at a time when more Americans had more money in savings than than they did in stocks. The extra gains in stocks since 2009 have come at the expense of interest income, which would have been enjoyed by a broader portion of the population who would have spent a greater portion of the income. There is a role for the Fed to play in helping the economy recover from financial crises. There are reasons to keep interest rates low during recessions (stimulate credit growth, reduce corporate bankruptcies, etc…). The wealth effect is not one of them. There have been as many as 42 recessions and five depressions in the US since the 1780s. The US economy recovered from every single one, returning to growth within an average of roughly one and a half years. That includes the 39 recessions and depressions that proceeded the establishment of the Federal Reserve in 1913, and the 20 that occurred when the US had no central bank at all. The US economy and other free market economies recover from recessions. The US economy would have recovered from the 2008 financial crisis, Fed stimulus or not. That is not to say that the Fed’s actions during the actual recession did not have an effect, or that they did not have any positive effects. It is to say that suppressing interest rates for nearly a decade after the recession had passed for the explicit purpose of driving up stock prices did not create wealth nor economic growth. It simply widened the wealth gap. When the next recession eventually arrives, let’s hope the wealth effect is a mistake that central banks don’t repeat. That is exactly right. The extreme wealth gap in this country is not from ‘capitalism’. It is from the lack of capitalism: the unwillingness to let failed enterprises fail, and the unwillingness of the Fed and the government to accept an interest-rate market mechanism. There is a continuation of the rich getting benefits at the taxpayers expense now more than ever. The 1% has purchased politics and has been able to acquire more than half the wealth in the USA. The idea of wealth trickling is a lie when you steal it in the first place. Vote outside the single party line. Vote for a humanist even if one is not provided by the party.